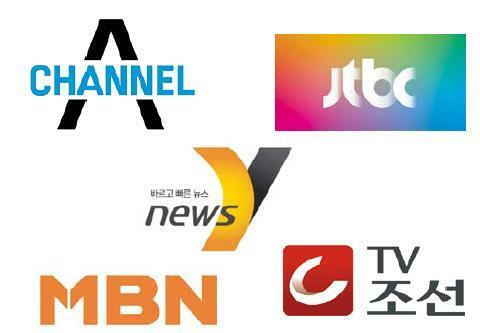 Logos for the four general programming channels Channel A, jTBC, MBN and TV Chosun, and all-news channel News Y. Four new general programming cable TV broadcasters will go on air Thursday, with dozens of grand-scale drama series and variety shows to appeal to the nation’s 23 million cable, IPTV (Internet TV) and satellite TV subscribers. Four media consortiums led by top daily newspapers ― the Chosun Ilbo, Dong-A Ilbo, JoongAng Ilbo and Maeil Business Newspaper ― are anticipated not only to rake in the money through the new channels, but increase their voice on a variety of issues. Channel A, ran by Dong-A, has been given channel 18, while TV Chosun has been given no. 19, jTBC, ran by JoongAng, 15 and MBN, ran by Maeil Business, channel 16. Yonhap News Agency, the nation’s key news service, was the sole winner of the license for an all-news cable television channel and its broadcast arm, News Y, will also go on air on channel 23 beginning Thursday. Nine out of every 10 households in Korea are currently cable TV, IPTV or satellite TV subscribers that can view the five channels without paying extra. The general programming cable TV broadcasters air a variety of programs in a similar manner to the existing three terrestrial broadcasters. The new programmers are also free from government regulations on the number and the length of direct and indirect commercials they air, which means they are free to have commercial breaks during a program. However, media industry insiders raise concerns about the quality of the content given the time for preparation. Among the four channels, jTBC appears to have put in the most money and effort with five soap operas and nine entertainment programs lined up already. Spending a large amount of money, the broadcaster has managed to cast top stars including Jung Woo-sung, Han Ji-min, Song Il-gook and Kim Hee-ae in its dramas. Some of the star TV directors, including Yeo Woon-heok, producer of MBC’s hit program “Goldfish,” Lim Jung-ah, whose works included popular survival show “Star Audition,” and Kim Si-kyu, producer of music show “Yun Do-hyun’s Love Letter,” have also joined jTBC. In a poll taken last month, 86 percent of TV producers chose jTBC as the “most likely broadcaster” among the four to have the most success. Channel A, meanwhile, was picked as the least likely channel to succeed. TV Chosun, meanwhile, is aiming to grab the attention of older, male audiences, believing they will be less interested in the youngish programs lined up by jTBC. Its key program so far is the primetime soap “Hanbando,” a story of the future Korean Peninsula and reunification with North Korea, starring veteran actors Hwang Jung-min and Ahn Sung-ki. But aside from Maeil Business Newspaper, which was already operating a news channel, these consortiums are newcomers to the broadcasting industry and thus are expected to find a bumpy road ahead. One of the biggest problems so far is the fact that many of the programs will go on air without sufficient testing for technical problems. Programmers usually conduct test broadcasting at least one month ahead of airdate to prevent technical errors. Even jTBC, which was first to choose Dec. 1 as its opening date, has not even begun shooting some of its main lineups. The political and ideological tendencies of the four channels are viewed as another potential problem. Six consortiums vied for the nation’s first comprehensive cable TV licenses with the largest four becoming the final winners. All four newspapers are conservative and right-wing, sparking concerns over their impact on the overall media. The Citizens’ Coalition for Democratic Media held a press conference Tuesday, announcing it will set up a broadcast monitoring network of some 447 civic and media groups to keep an eye on the tone and fairness of news and documentaries aired by the four comprehensive programmers.